Found this snail on the path during my sons field trip to study nature. Saw some wood peckers but, didn't get any good shots of them. pp was crop, hue/sat, bright/contrast, shadows/highlights, dodge/burn/sponge unsharp twice, resize and save for DPC. Post challenge... my pb so far. just wanted to give you the original (except for resize) so you can see the color of the snail is very close to the entry. It was enhanced just a bit but the snail really was that color. And here is a shot of the kids looking at it too(well some of them). Very nicely done and congrats on the new personal best! It really is a lovely critter - I've never seen one quite so colorful before! Haha, I told you the best shot slug would get a 5.9 or so. :) You actually could have hit 6 with this one with just a little more work on the processing. It's a great shot! I laughed inside when you said that last Saturday. And I wanted to tell you what my free study entry was then.... but obviously I didn't. what colors! 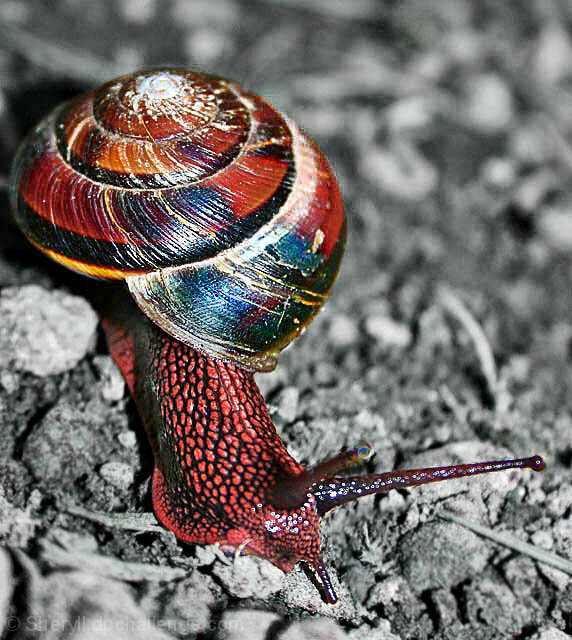 but are snails realy red like this? that's an amazing animal, nice close up, good desat on the ground - colors I'm guessing have been pushed in terms of saturation which is an ok effect. The vertical orientation is a bit too much tension. Good job on the Sel. Desat. you got right up in there and you did a outstanding job. Proudly hosted by Sargasso Networks. Current Server Time: 04/23/2019 12:14:34 AM EDT.